The rehabilitation management of individuals with rheumatoid arthritis is imperative to decrease the potential long-term disabilities as noted above. Specifically, individuals with rheumatoid arthritis are at risk for decreased flexibility, muscle atrophy, decreased muscle strength and reduced cardiovascular endurance. Deficit in such areas will lead to functional compromise and increased health care expenditures. Therefore, a multifactorial approach utilizing medications and rehabilitative techniques is necessary. Fortunately, under proper counseling, individuals with rheumatoid arthritis can safely exercise, improving overall physical fitness, greater ease for activities of daily living and an improved sense of well being. Rehabilitative techniques include appropriate periods of rest and activity modification; therapeutic modalities such as heat/cold or electrical stimulation; bracing and adaptive equipment. Rest and energy conservation can be helpful for locally inflamed joints, but should be avoided long-term due to the potential deleterious side effects. Acutely, resting of involved joints can assist with pain management and decrease the inflammation of the involved joint. However, the potential side effects of inactivity include decrease range of motion, loss of strength, altered joint-loading response, and decrease aerobic capacity. In studies by Mueller (ref 10) patients on strict bed rest lost 1.0% to 1.5% of their initial strength per day over a two-week period. In contrast, Gerber et al (ref 6) studied the importance of energy conservation and interruption of daily activities lasting greater than 30 minutes. Patients appeared to benefit from the modification of activity and were taught to recognize those activities that caused pain and fatigue. A structured exercise program can be greatly beneficial to the overall well-being and functioning of the individual with rheumatoid arthritis. Such a program should focus on stretching, strengthening and aerobic conditioning while conserving energy. Acutely, inflamed joints should be rested to prevent exacerbation of symptoms. For non-inflamed joints, active or active-assisted stretching of all major joints is essential to prevent contracture formation and maintain the current range of motion to perform most activities of daily living. It is commonly thought that contractures can be prevented by once daily range-of-motion exercise. Most importantly, for bedridden patients, proper positioning is necessary to prevent joint contracture. (ref 4) Treatment of contractures must be done in a safe manner such that overly aggressive stretching does not occur. Additionally, the presence of a bony block must be excluded as a causative factor in prevention full joint motion. Strengthening exercises should be utilized in non-inflamed joints; while isometric exercises can help maintain strength to prevent injury or facilitate fatigue. According to Hettinger, daily isometric contractions of 10%-20% of maximum tension held for 10 seconds can maintain isometric strength. In RA patients, it has been shown that isometric strengthening can lead to ADL performance with reduced effort and an increase in V02max, which is a measure of ones work capacity using oxygen consumption. Exercise programs should progress slowly, while monitoring the patients for signs of inflammation(ref 5). Several studies have shown the benefit from an aerobic conditioning or aquatic exercise program. In several studies, van den Ende et al (van den Ende, 1996 and 2000) showed that short term intense exercise program consisting of dynamic and isometric strengthening and bicycling could improve muscle strength without deleterious effect on disease activity. However, the authors recommended continued long-term studies to note the effect on disease progression and functional ability. Danneskiold-Samsoe et al (ref 2) studied a small group of patients to assess the effect of exercise in a heated pool. They suggested that in-water exercise would decrease the forces against joints, and the warmth could help decrease joint pain and decrease muscle spasm. They noted an increase in strength and endurance from the water exercise program. Indeed, aquatic therapy should be beneficial for individuals whom have difficulty with weight bearing or balance. Hakkinen et al (ref 7) examined the aerobic capacity of physically active females with early or long-term rheumatoid arthritis and healthy women. The physically active females’ aerobic fitness was similar to the age matched healthy women. However, the explosive strength measurements were lower in the women with rheumatoid arthritis. de Jong et al recently published results for long term follow-up on strength training and aerobic activity in rheumatoid subjects(ref 1). One group underwent a more rigorous training program consisting of circuit training, sport related activity, and bicycle training. The control group participated in physical therapy, but was not allowed weight-bearing or high impact activities. It was concluded that high intensity exercise is more effective in improving functional ability, aerobic fitness, and muscle strength and does not appear to promote worsening of RA in terms of radiographic progression. The general use of modalities for the treatment of arthritis is based on its primary effect on its target. However, when selecting the appropriate modality, one must recognize that there is a lack of well-designed clinical studies that show specific effects for rheumatoid or osteoarthritis(ref 17). Superficial heat has its greatest effect on the skin and subcutaneous tissues (Feibel 1976). It is especially useful in circumstances where the goal is to heat joints that are covered by little soft tissue such as those in the hands and feet. Superficial heating agents are delivered by three mechanisms: conduction, convection, or conversion. Conductive methods: Hot moist packs (Hydrocollator packs) which warm body tissues more rapidly than dry heat, but no difference in therapeutic benefits have been reported(ref 8). Paraffin wax heats the distal joints of the upper and lower extremities. Heating pads, either are another alternative. Contrast baths involve alternating immersion of a limb into hot and cold water to produce reflex hyperemia. Convective methods: Hydrotherapy involves the use of water, either hot or cold, to treat conditions. Forms of hydrotherapy include whirlpool baths (partial body emersion), Hubbard tanks (whole body emersion), and contrast baths which are specifically used for RA, neurogenic pain, sprains and strains, and mild peripheral vascular disease. Fluidotherapy produces a warm, air-fluid mixture that is referred to as fluidotherapy. This produces a warm, air-fluid mixture that is referred to as fluidization. Presumed benefits include a massaging action and ability to perform range-of-motion exercises. Conversion methods: Radiant heat, such as infrared radiation, mostly used for patients who cannot tolerate the weight of hot packs. The energy is absorbed by the skin and converted into superficial heat. Deep heating increases the tissue temperature at a deeper level without overheating skin and subcutaneous fat. Examples of deep heating include ultrasound and diathermy (the use of high-frequency electromagnetic currents to induce heating of biologic tissues), including shortwave and microwave. Ultrasound is used in a variety of conditions, including joint contracture, scar tissue, periarticular inflammation, bursitis, muscle spasm and pain, and osteoarthritis. A form of ultrasound, phonophoresis, is proposed to aid in the transdermal movement of topical medications. The most commonly used are corticosteroids and local anesthetics. The main indications are the same as those in general therapeutic ultarasound use, as well as tendonitis, scar tissues, fasciitis, and adhesions. Diathermy, both short wave and microwave involve similar principles. Short wave uses lower frequencies than microwave, and both use electromagnetic radiation to heat tissue. They are used to heat relatively superficial muscles and joints. Cold therapy has several physiologic effects that enhance or suppress normal responses to certain stressors. Hemodynamic effects include reflexive vasoconstriction followed by delayed vasodilation. Neuromuscular effects include slowing of nerve conduction velocity, and decreased firing of the muscle spindles, which have been shown by some to reduce spasticity. Effects in joints are thought to take place by decreasing synovial collagenase activity, making it effective in inflammatory arthropathies(ref 13). General uses of cold include relief of muscle spasm, reduction of spasticity, and control of inflammation in the acute inflammation stage. Superficial: Most forms of cryotherapy are considered superficial include cold packs (conduction), and ice massage (conduction). Cold baths are meant for immersion of larger areas (e.g. immersion of distal limb), but are more uncomfortable. Other: Vacocoolant sprays, such as ethyl chloride or florimethane, are used for “spray and stretch” technique for areas of spasm (Simons 1994). Electrotherapy involves the use of electrical impulses to stimulate the muscle or nerve. The primary indication for the use of electrotherapy is analgesia via the “gate theory of pain”(ref 9). 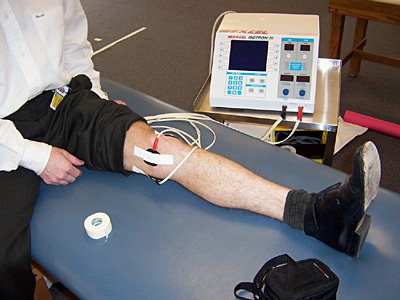 Electrical Nerve Stimulation: The primary delivery mechanism is via transcutaneous electrical nerve stimulation (TENS). Its use has been reportedly positive in RA and OA among other conditions. Common uses include musculoskeletal pain, peripheral nerve injury, peripheral neuropathy, postsurgical pain, and complex regional pain syndrome. Iontophoresis: Iontophoresis is believed to work through the transcutaneous delivery of charged medications (i.e. lidocaine, corticosteroids, salicylate, antibiotics). Its efficacy is unproven, but is used for delivery of substances that need local penetration in order to avoid systemic effects, and in cases where oral absorption is variable or contraindicated. Interferential current (IFC): IFC uses alternating current signals of different frequency in order to penetrate tissue without discomfort. Proposed uses include musculoskeletal or neurologic conditions, although, like most other modalities mentioned, literature fails to demonstrate definite benefits over placebo. Deformities resulting from RA or OA can limit a patient’s functioning, an often overlooked consequence of the disease. Most deformities involve the hand, knees, feet, and shoulder. A careful decision should be made regarding the goal of orthotic prescription (e.g., prevention of foot-drop, relief of joint contractures). Joint preservation techniques are vital for prolonging patient independence. Orthotic devices can make activities of daily living much easier, leading to a greater degree of independence. A physical therapist can also help teach patients which movements to avoid (i.e., those which create greater tension of the digits) and appropriate range-of-motion exercises. Often, the most debilitating musculoskeletal consequence of RA involves the derangements of the hands. Examples include the Boutonniere and Swan Neck deformities are pictured below. The primary goals in treating the rheumatoid hand are preventing deformity and relieve pain. Podiatric orthotic management of the arthritic foot can offer a conservative approach to reducing pain associated with walking and weight-bearing. This can be accomplished through a variety of methods from correct sizing and fit of shoes to the incorporation of different materials in construction of the shoe. In addition to shoe modifications, customized orthotic devices can be employed in the treatment of the arthritic foot and ankle. Here too, the materials used can make a difference in the degree of comfort for the patient. Less rigid materials tend to provide less biomechanical control of subluxing joints, but are often more comfortable. Ankle foot orthoses can also be employed to lessen joint contractures or assist any weakened muscles around the ankle. 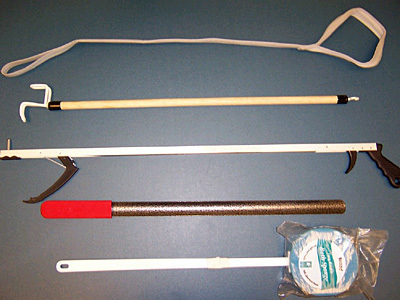 Adaptive equipment, such as those pictured above, addresses the independence of affected patients, which is measured by the Functional Independence Measure (FIM). 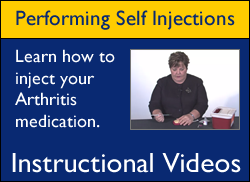 Assessment of the patient with arthritis can determine range-of-motion, muscle tone, strength, and coordination. Incorporating the proper aid for the patient is determined by a self-care assessment by an occupational therapist. Self care focuses on dressing, feeding, hygiene, and grooming. Adaptations for utensils include built-up handles and plate guards. Dressing aids include zipper pulls, velcro straps, and button aids. Grooming and hygiene are limited by the inability to grasp and hold objects. A utensil cuff is a strap that can accommodate small items, such as a toothbrush. With the proper training, these can be important adjuncts for independent living. 1. de Jong Z, Munneke M, Zwinderman AH, Kroon HM, Jansen A, Ronday KH, van Schaardenburg D, Dijkmans BA, Van den Ende CH, Breedveld FC, Vliet Vlieland TP, Hazes JM. Is a long-term high-intensity exercise program effective and safe in patients with rheumatoid arthritis? Results of a randomized controlled trial. Arthritis Rheum 48(9):2415-24, 2003. 4. Fox P, Richardson J, McInnes B, Tait D. Bed positioning programs for older adults in a chronic care hospital: a survey. Physical & Occupational Therapy in Geriatrics 15(1):75-89, 1997. 5. Galloway MT, Jokl P. The role of exercise in the treatment of inflammatory arthritis. Bull Rheum Dis 42(1):1-7, 1993. 7. Hakkinen A, Haanonan P, Nyman K, Hakkinen K. Aerobic and neuromuscular performance capacity of physically active females with early or long-term rheumatoid arthritis compared to matched healthy women. Scand J Rheumatol 31(6):345-50, 2002. 10. Mueller EA. Influence of training and of inactivity on muscle strength. Arch Phys Med Rehabil 51:449-462, 1970. 11. Odeen I. Reduction of muscular hypertonus by long-term muscle stretch. Scand J Rehabil Med 13:93-99, 1981. 14. Simons DG. Chronic Myofacial Pain Syndrome. Handbook of pain management, ed.2, Baltimore 1994, Williams and Wilkins, pp.556-577.